I thoroughly enjoyed this cosy mystery and it didn't hurt that it was set in a needlework shop. This type of shop brings together all sorts of people who generally wouldn't associate with each other except for their craft. Makes for an interesting set of suspects when the shop owner, Margot Berglund, is murdered. Her sister Betsy is left to clean up and take over the shop. Due to the various visitors to the shop and their different interests, author Monica Ferris offers up lots of potential murderers. She also created a tight circle of staff and frequent customers to guide Betsy and to question what happened. Interestingly, Betsy didn't set out to solve the mystery, she just wanted to straighten out her sister's affairs and get clear in her mind how she died. Being a needlework fan myself, I particularly enjoyed the discussions of fibres and projects. I liked the sense of community of most of those who visited the shop. Ms. Ferris kept me interested by slowly doling out clues and connections. She didn't eliminate suspects one by one, but rather kept them all under suspicion. Crewel World is the first in Monica Ferris's Needlework Series, which now stretches to nineteen books. Mary Monica Pulver has published her works under a number of names including: Monica Ferris, Margaret Frazer and Mary Kuhfeld. I thought I'd try something a little different for today's post, a book review of a needlework inspired work of fiction. In my pre-blog days I read books from several different series and rather enjoyed them. This is my first in a long time. 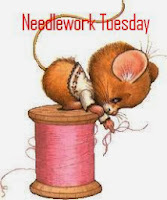 Do you read craft/needlework fictions. leave me a comment with the series and author names or add a linky to a review you've written even if it's not new. Don't forget to leave a link to your current needlework post. If I do a post for NT at all, it'll be tomorrow or the next day. I just reread a book from a few years ago. It is called "Wedding Ring" by Emilie Richards. It is a story about 3 generations of women and a quilt, that ties them all together. It is the first book in a series of books, all with a quilt in the plot, and a quilt in the title. I read them all, when they first came out and I enjoyed reading this one again. I think I read that book - or at least something from that series. I'll have to revisit them. I love cozy mysteries. Good idea for a change-up on NT. I have a topic I'm posting about, but have been out of town - hopefully will be posted this afternoon. Haven't read this series, but I'll be putting it on my ever growing list of series books to read. It sounds like a good book. Have a great day!